Why? Because Aug. 3 marks one year since we launched students.wlu.ca, the web property designed specifically for you – a Laurier student. As you prepare for the fall 2017 term, we encourage you to explore students.wlu.ca, especially the My Laurier tab, located in the top right corner of the site. 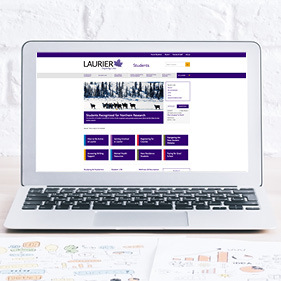 The My Laurier tab allows you to personalize access to your online content, including your timetable, quick links to your favourite sections of the website, and calendar feeds. Log in to the My Laurier tab with your @mylaurier username and password to access enhanced features and set your preferences, including your home campus, level of study, and customized quick links. Each time you sign in to students.wlu.ca, the content most relevant to you will be even easier to find. Another bonus? Once you’re signed in, you can go directly into your Webmail, MyLearningSpace, and Library account without having to re-enter your credentials. This website has been designed for you, based on your feedback. If you have questions or comments about students.wlu.ca, we’re all ears. Email us at webteam@wlu.ca.